Steinernema Carpocapsae nematodes (SC) is most effective against flea larvae, ticks, ants, and caterpillars in lawns, garden soil, and under trees where larvae pupate. S. carpocapsae tends to be most effective when applied against highly mobile surface-adapted insects. Target Pests: Fleas, Ticks, Codling moth, German cockroach, Subterranean Termites, Asian cockroach, American cockroach, Fruit fly, Ants, Armyworm, Beet armyworm, Cucumber beetle, Artichoke plume moth, Cutworms, Earwigs, Sod webworm, Black cutworm, Mole cricket, Corn earworm, Cotton bollworm, Tobacco budworm and leafminers, Iris borers. Symbiotic microbes and nematodes make a versatile combination that is lethal to a variety of insects found in soil. That combination may now prove useful in controlling not just pests of plants but of people. Researchers from the Department of Agriculture are exploring the use of nematodes in attacking the hard-to-spot ticks involved in the spread of Lyme disease to humans. At the Agricultural Research Service in Beltsville, Md., parasitologist Dolores Hill has tested Steinernema and Heterorhabditis nematodes for their ability to control adult deer ticks. The nematodes crawl or bite into the tick's body, then release their microbial partners, which infect and kill the tick within 24 hours. "Nematodes are extremely effective" against one stage of the ticks' life cycle, says Hill. She plans this fall to test woodsy residential areas visited by tick-carrying deer. It may be possible to reduce the numbers of egg-laying female ticks and thus reduce the number of young, disease-transmitting ticks the following spring. Other USDA researchers are exploring the use of fungi as yet another biological alternative to tick-killing chemical sprays. Nematode Application: For 50 Mil. and larger quantities. 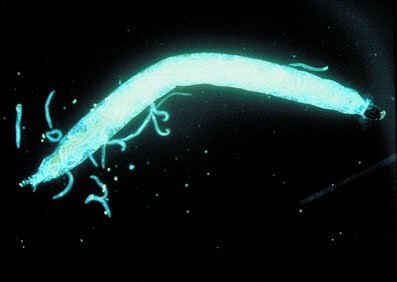 Nematodes packaged in an inert powder carrying material that dissolves in water. Applied one teaspoon of the beneficial nematodes per gallon of water. Application in using a watering can, backpack sprayers, pump sprayers, irrigation systems, hose-end sprayer, or motorized sprayer. After mixing the nematodes with water, use the spray solution immediately. Evenly spray the solution over the ground areas to be treated. Continuous mixing should take place in order to prevent the nematodes from sinking to the bottom of the container. Keep the soil slightly moist during the first 7 days after application to help establish the nematodes in the soil. Sprinkle the turf or soil again with water after the application of the nematodes. Apply nematodes as soon as possible for best product performance. You may keep the package of nematodes in the refrigerator for up to 3 weeks upon receiving the product. Nematode Application: For 10 Mil. Nematodes packaged on a sponge. Place the entire sponge in a bucket add two quarts of water, squeeze sponge for a few minutes to get the nematodes out of the sponge. Discard the sponge and pour the bucket of water into a sprayer or watering can. Add another gallon of water to dilute the nematodes and to make up the volume for your sprayer. The 10 Mil. Nematodes can only be kept for up to 3 days in refrigeration.